This article is about the UK band. For other bands with the same name, see Smile (disambiguation) § Bands. Smile were an English rock band based in London, best known as the predecessor to renowned rock band Queen. The band was formed in 1968 by Brian May, who went on to become Queen's guitarist. 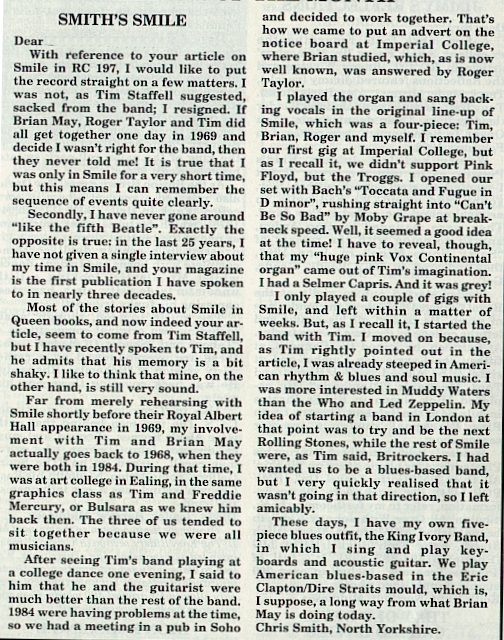 It included Tim Staffell as lead singer and bass guitarist, and later, drummer Roger Taylor, who also went on to play for Queen. They recorded only six songs and disbanded in 1970. These songs were titled “April Lady”, “Step on Me”, “Polar Bear”, “Earth”, “Blag”, and a song later re-recorded by Queen for the Queen album of 1973, “Doin’ Alright”. These songs exist on vinyl on the LP Ghost of a Smile. "April Lady" was dedicated to Roger Taylor’s girlfriend at the time. In 1968, Brian May, a student at London's Imperial College, and Tim Staffell formed a group when May placed an advertisement on the college notice board for a "Ginger Baker type" drummer, and a young medical student named Roger Taylor auditioned and got the job. Smile were signed to Mercury Records in 1969, and had their first experience of a recording studio in Trident Studios that year. Staffell was attending Ealing Art College with Farrokh ("Freddie") Bulsara, and introduced him to the band. Bulsara soon became a keen fan. Smile gigged quite a bit on the London scene, according to Time Out's listings. On 19 April, they played at the Speakeasy and on 31 May, appeared at the Whisky-A-Go-Go. In March 1969, the band played at a venue known as PJ's, using claims to have previously been played on BBC Radio 1 to secure an audience. It seems likely that the claims were fictitious, however. Shortly after they were given a one-off recording deal by Mercury Records to record three tracks, "Earth" (Staffell), "Step on Me" (May), and "Doin' All Right" (May/Staffell). These were recorded in June 1969 at Trident Studios in Soho. Ultimately this U.S. promotional recording was never published commercially, however, in September of the same year, Mercury Records commissioned them to record three more songs: "April Lady" (Stanley Lucas), "Blag", and "Polar Bear", a "gentle song about a polar bear" written and led by May, at De Lane Lea Studios. Again, the record was not released at the time. When Staffell left in 1970 to join another band, Humpy Bong, Smile effectively disbanded. Bulsara persuaded May and Taylor to continue, and at about the same time, changing his surname from Bulsara to Mercury, joined the band as lead vocalist, from which emerged "Queen". This new band tried a number of bass players during this period, namely Mike Grose, Barry Mitchell and Doug Bogie, none of whom fitted with the band's chemistry. It was not until February 1971 that John Deacon completed the lineup, and they began rehearsing for their first album. This definitive lineup lasted until Mercury's death in 1991, their last album being Made in Heaven, released posthumously in 1995. For their debut album, Queen recorded "Doing All Right". According to the book "Queen: The Early Years", Staffell has been well compensated through royalties from the sale of the album, given his co-songwriting credit for the song with May. Queen also recorded the song for their first BBC recording session with John Peel. That session, along with their third session, have been released in the UK as At the Beeb (Band of Joy Records) in 1989, and in the U.S. as Queen at the BBC (Hollywood Records) in 1995. Also in 1995, Queen issued their "Let Me Live" singles, one of which features three of the first session BBC recordings, including "Doing Alright". Smile reunited for several songs on 22 December 1992. Taylor's band The Cross were headliners and he brought May and Staffell on to play "Earth" and "If I Were a Carpenter". May also performed several other songs that night. In 2018, Smile reunited once more in Abbey Road to re-record "Doing All Right". This release was used in Queen's Bohemian Rhapsody movie. Gettin' Smile (LP) from Japan, released 23 September 1982, on Mercury Records. The sleeve contains notoriously inaccurate lyrics and songwriting credits for the songs. This release was used for all subsequent bootlegs which contain the songs. Ghost of a Smile (CD) from the Netherlands, released in 1997, on Pseudonym Records. The CD booklet is comprehensive and features new liner notes by Staffell. All the tracks were newly remastered. The album also features two versions of the Eddie Howell/Freddie Mercury collaboration "The Man from Manhattan" (no relation to Smile, except that May plays guitar on it). There is a bootleg album of their early tracks circa the Smile-era titled Pre-Ordained. Most of them also appeared on the 1995 Italian bootleg In Nuce. The following songs have been confirmed by the members of the band as being part of their repertoire, either live or in their short-lived studio time. "Step on Me" (Staffell/May) originally from May and Staffell's band 1984. "If I Were a Carpenter" (Tim Hardin) A cover regularly featuring in their live set. "April Lady" (Lucas) A song presented to the band by Mercury Records during their second studio session. "Step on Me": Two versions were recorded by the pre-Smile band, 1984, as part of a demo tape made at ITV Studios, London, England on 31 March 1967. "April Lady": Southern Comfort (the band remaining after Iain Matthews left Matthews Southern Comfort) recorded this on their Frog City album (Harvest SHSP 4012; 1971) (although it is not included on the CD version). On the record label this song is mistakenly credited to Carl Barnwell. It may have come to them via Fritz Freyer, who produced the Smile version, who had connections with Matthews Southern Comfort. "April Lady" and "Earth": Staffell joined the band Morgan and title track of their first album Nova Solis (1972) incorporates excerpts from "April Lady" and all of "Earth". "Doing All Right": Recorded by Queen for their first BBC session on 5 February 1973. This version appears on At the Beeb (1989) in the UK, and Queen at the BBC (1995) in the US, as well as on the CDQUEEN24 single "Let Me Live" as a B-side. Queen also recorded this song for their debut album, Queen (1973), with the slightly altered title, "Doing Alright". This version also appears on the US-only 7" single for their song "Liar" on Elektra Records (1974). "Polar Bear" and "Silver Salmon": Queen recorded these as demo tracks, as yet unreleased, during their debut album sessions. "See What a Fool I've Been": Queen recorded this in August 1973, during their second album sessions (Queen II). It did not appear on the album, but was released as the B-side to the album's single "Seven Seas of Rhye" (1974). This version later appeared on the Queen boxed set The Complete Works bonus LP Complete Vision. Hollywood Records re-issued Queen II in the US in 1991, with this song as a bonus track. The UK and Japanese CD3 singles (1987 and '90 respectively) include the song again as the B-side for "Seven Seas of Rhye". Queen also recorded this song as part of their fourth BBC session with John Peel. "Blag": Though never recorded again as such, the featured solo evolved (and continues to evolve) through May's career both with Queen and as a solo artist. Recorded versions of the solo include: "Son and Daughter" (third Queen BBC session, 1974, released on the aforementioned BBC album), "Brighton Rock" (from Queen's third album Sheer Heart Attack in 1974), "Brighton Rock" (from Queen's live album Live Killers in 1979), as "Guitar Solo" (from Queen on Fire - Live at the Bowl recorded 1982), "Brighton Rock Solo" (recorded in 1986, on Live At Wembley '86, released 1992), as "Guitar Extravagance" (from The Brian May Band live album Live at the Brixton Academy in 1993), and recently again as "Guitar Solo" (on the Queen + Paul Rodgers live album Return of the Champions in 2005). "Polar Bear": Valensia recorded this for his album Queen Tribute in 2003. "Earth" and "Doin' Alright": Staffell recorded these songs for his solo album aMIGO (2003). Both tracks feature May on guitar and vocals. "Earth" features Morgan Fisher (formerly of Morgan) on keyboards. "White Queen (As It Began)": Recorded by Queen for their second album, Queen II (1974). Also recorded for their fourth BBC Session on 3 April 1974. Two live performances of the song were officially released on Live at the Rainbow '74. ^ Hepworth, David (25 May 2011). "God Save The Queen by David Hepworth (Radio Times)". Queen Online. Retrieved 8 October 2015. ^ a b "Pre-Queen - Smile!". 30 May 2004. Archived from the original on 2 September 2002. Retrieved 29 October 2011. ^ Reed, Ryan (5 September 2018). "Queen Unearth Live Aid Recordings for 'Bohemian Rhapsody' Soundtrack". Rolling Stone. Retrieved 10 September 2018.